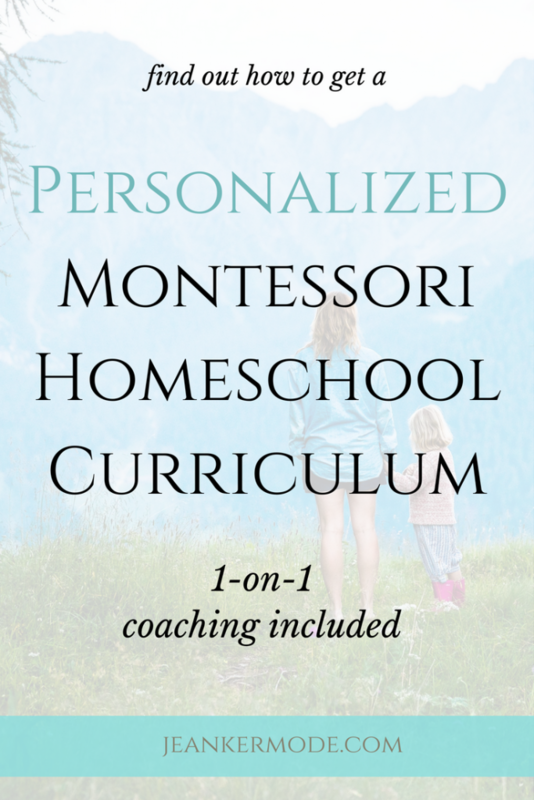 A Montessori homeschool curriculum, made just for you. Are you hoping to incorporate some Montessori wisdom into your homeschooling curriculum? Have you heard a lot of different things about Montessori education, but are unsure exactly what it would look like to try Montessori at home? Maybe you’ve read a bunch of different posts and books, but so far you’ve just been winging it with the various Montessori materials and free downloads you’ve acquired. Or, you’re already in love with Montessori, but homeschooling still works best for your family and you’re hoping that doesn’t involve 12 super complicated Montessori albums you need to decipher and follow. Well, I would love to help you. Let me design a homeschooling plan for you family, and then let me stick with you while you implement it. With a personalized-for-your-family curriculum structure, infused with Montessori principles and strategies, your little ones get to stay home with you and benefit from the Montessori wisdom. And, you don’t have to do it all by yourself! No more trying to choose between that expensive Montessori school you can’t afford and homeschooling your kids like you’ve always wanted to. No more throwing together bits and pieces of “Montessori” advice from the internet. No more downloading super detailed and overwhelming Montessori albums, only to get lost in the presentations and materials. Instead, you can follow a plan designed with your family in mind and with authentic Montessori at heart. Talk with you to get to know your family’s needs and goals. Design a curriculum for your 3-6 year olds, based on authentic Montessori principles – it won’t be a rigid, daily curriculum, but an overall structure to guide you through the year and help you follow your child through his phase of development. Recommend age-appropriate materials and activities to complement the curriculum. Provide one-on-one support, via phone or Skype, to help you choose and implement activities at the right time for your child, trouble-shoot difficulties, and help you understand the theories behind the method. With this help, you’ll have the benefit of true Montessori wisdom, not just the fluff, to guide you as you homeschool your child. You can check in with me throughout the year, so you’re never lost or left behind. You can experience the joy of following your child and finding what works for your family. Let me introduce myself real quick. I’m Jean Marie, and I am so passionate about education and the family. I was homeschooled all the way through middle-school, and I am forever grateful for those years I got to spend at home with my mom and siblings. For a long time I have sought to help other children experience the same joy in education that I had. I’ve worked in several different educational settings, from tutoring homeschooled kids, assisting in preschools, and substitute teaching in kindergartens, to teaching my own classroom of lovely preschoolers. I’ve always tried to make my classroom as homey as possible, remembering the peace and flexibility of my own home education setting. I have a Master’s degree in Montessori education and a Primary diploma from the Association Montessori Internationale. I love the Montessori method. I now combine my experience, knowledge, and love with my desire to help families educate their children. Am I going to make you buy a bunch of expensive materials? – Nope. Though Montessori materials are amazing, I don’t actually recommend replicating a whole Montessori classroom inside your home. I will recommend a few materials if you’re interested, but we will be focusing more on how you can best apply the Montessori principles in your home. We’ll get creative. Am I going to give you Montessori albums or a list of presentations to follow? – Nope. Without going through Montessori training, it can be really difficult to understand and follow complicated albums. I spent 9 months learning the ins and outs of Montessori lessons. It’s not really something you can download in an album. What I will give you is an outline of specific educational milestones, and concrete advice as you guide and follow your child through them. Am I going to turn you into a full-fledged Montessori guide? – Nope. I’m not going to be giving you Montessori training. I offer coaching on how to best apply the Montessori method to your situation. Can I find this for free somewhere? – There are awesome support groups out there, but they don’t offer personalized, one-on-one coaching from a trained, experienced, and passionate Montessorian. Plus, the word “Montessori” gets thrown around a lot. People have their own interpretations. I trained with the Association Montessori Internationale, which has the most rigorous standards for authentic Montessori principles and applications. I will always give you true Montessori. Ready to Implement Authentic Montessori In Your Homeschool? Let’s start with a free call, with no obligation to buy. We’ll chat about how I can best help you. When you’re ready, you can purchase the Homeschool Curriculum and Coaching package that works best for you. (There’s a one-semester package, and a full-year package.) As soon as you purchase the package, I’ll get started on your personalized plan, we’ll schedule your first coaching call, and you’ll be ready to go. I can’t wait to help you implement Montessori at home!